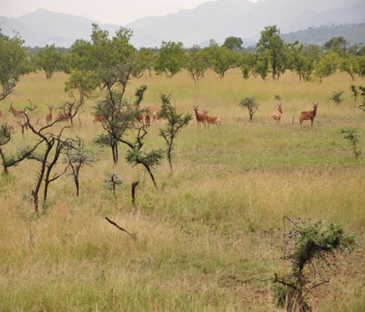 MzNP is one of the wildlife conservation areas known for its good population of the critically endangered endemic Swayne’s Hartebeest population. The park covers an area of 220 k.m2 and located 460km and 235 south west of Addis Ababa and Hawassa, respectively, in Gamo-Gofa Zone. have been recorded. It is one of the three sites in the world where good population of the endemic Swayne’s Hartebeest’s population still survive. Besides, orbi, bohor red buck, buffalo, warthog, bushbuck, waterbuck, greater kudu, lesser kudu, bush pig, onubus baboon, vervet monkey, lion, leopard, wild cats, serval cat are among others .common species. The Park is fortunate in possessing a number of rivers and streams which ultimately drains to Omo River. The name of the park derived from the river that crosses the park called Maze River. The landscape of MzNP is surrounded by interesting high rugged mountain ranges, escarpment, and small hills. The landscape is breathtaking and important for sustainable eco-tourism development. The MzNP and the surrounding area have different natural, cultural and historical attractions such as Bilbo hot springs, Wenja stone cave, “KaouwaWella”(YeniguseWarka), Bilbo/Halo Hot Spring: The hot spring is situated at the upper parts of Maze River in the park It is a form of geyser, which shoot up hot water from deep in side the ground. The smoke released from this hot spring, cover wide area and seen from a distance. People from far areas and local people used it as traditional medicine. Religious Site in Chosho Market: There are two oldest big trees in Chosho Market. These trees are believed as justice giving (court) by the local residents for any disagreement that may arise among them. The site is locally called “Kaouwowelloa” meaning the king’s tree. The road from Sodo to the park is all-weather gravel road covering a distance of 83km. It is also possible to use the road from Jinka to Betomela from the other sides of the park.